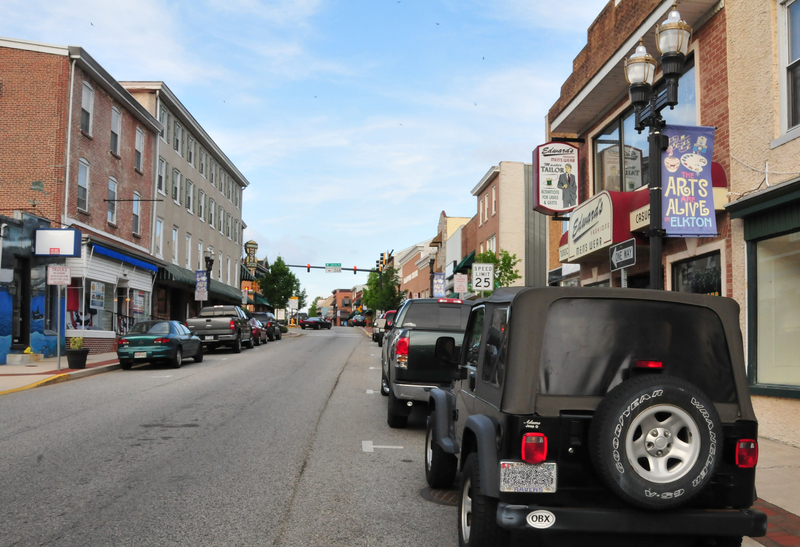 Elkton is also known as: Cecil County / Elkton town. Their current mayor is Mayor Robert J. Alt. Zip codes in the city: 21921, 21922. Cecil County funeral flowers can be purchased from one of the local funeral shops we partner with. Some of the notable people born here have been: Larry Webster (american football player), Stephen P. Anderson (songwriter), Dwayne Henry (baseball player), and Frank Hansen (actor). The town of Elkton is the county seat of Cecil County, Maryland, United States. The population was 15,443 at the 2010 census. It was formerly called Head of Elk because it sits at the head of navigation on the Elk River, which flows into the nearby Chesapeake Bay.Elkton was once known as the "Gretna Green of the West" because of its popularity as a place for eloping couples to marry. However, a state law was passed in 1938 requiring a 48-hour waiting period. To this day, there are several wedding chapels in the town. It was written by Bluefield Daily Telegraph on February 26th, 2019 that Thomas L Adkins died in Bluefield, West Virginia. Adkins was 71 years old and was born in Elkton, MD. Send flowers to express your sympathy and honor Thomas L's life. It was noted on February 20th, 2019 that Scott Randal Viars perished in Elkton, Maryland. Viars was 55 years old. Send flowers to express your sorrow and honor Scott Randal's life. It was revealed on January 19th, 2019 that Kathern Ennis Combs (Trivett) died in Elkton, Maryland. Ms. Combs was 88 years old and was born in Smyth Co, VA. Send flowers to express your sympathy and honor Kathern Ennis's life. It was reported on July 23rd, 2018 that Franklin "Frank" Guth died in Seminole, Florida. Guth was 74 years old and was born in Elkton, MD. Send flowers to share your condolences and honor Franklin "Frank"'s life. It was written on July 17th, 2018 that Charles Brooks passed away in Elkton, Maryland. Brooks was 39 years old. Send flowers to share your condolences and honor Charles's life. It was written by The Roanoke Times & World News on June 30th, 2018 that Donna Carol Grant (Rumburg) perished in Shawsville, Virginia. Ms. Grant was 57 years old and was born in Elkton, MD. Send flowers to express your sympathy and honor Donna Carol's life. It was revealed by The Star on May 27th, 2018 that Zora Leeanna Light (Phillips) passed on in Lincolnton, North Carolina. Ms. Light was 61 years old and was born in Elkton, MD. Send flowers to express your sympathy and honor Zora Leeanna's life. It was disclosed on December 23rd, 2017 that Edith Marie Ranieri (Meadows) passed on in Elkton, Maryland. Ms. Ranieri was 97 years old and was born in Long Bottom, WV. Send flowers to share your condolences and honor Edith Marie's life. It was written on August 7th, 2017 that Ann Emrey (Myers) passed away in Elkton, Maryland. Ms. Emrey was 81 years old. Send flowers to express your sympathy and honor Ann's life. It was disclosed on August 6th, 2017 that Lillie Peterson (Scott) passed away in Elkton, Maryland. Ms. Peterson was 90 years old. Send flowers to share your condolences and honor Lillie's life. the overall tawdry flavor grew to be too much for the state. Elkton is a town in Cecil County, Maryland County, Maryland, United States. . As a result, a number of Maryland towns near borders with other states became known as places to get married quickly and without many restrictions, or "Gretna Greens." Elkton, being the northeasternmost county seat in Maryland (and thus closer to Philadelphia, New York, and New England), was particularly popular. George Washington and Jean-Baptiste Donatien de Vimeur, comte de Rochambeau with their combined forces stopped in Elkton on September 6-7, 1781, while on their way to Yorktown. and Nancy Hyson of Elkton, Md. ; and three grandchildren. He was preceded in death by his parents; a son, Jason Ray Garrett; and a sister, Dianna Garrett Donelson. Funeral will begin at 2 p.m. Monday at Shelton Memorial Christian Church in Ulysses. nephews, Edward Larock, Denver, and Mark Larock, Elkton, Md., and their families ... ARN and Hospice Saint John. Harman Funeral Homes and Crematory Inc. (East), 669 W. Butler Drive, Drums, is assisting the family with the arrangements. A non-profit corporation working with the Town of Elkton to revitalize and preserve the town. Event calendar, membership and local information. Listing all funeral homes in Elkton, Maryland so you can easily send flowers to any location (same day delivery) or find any funeral service. funerals in Elkton, MD 21921 on Yahoo! Local Get Ratings & Reviews on funerals with Photos, Maps, Driving Directions and more.